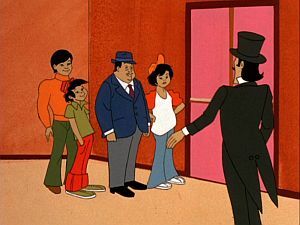 Charlie Chan is brought in to investigate Hamid Bey, a jewel thief, who is hiding among the performers of a magic show. Once involved, Chan and family find themselves involved in the disappearance of the show's star performer, a dog named FiFi. Osiris - The Egyptian god of the underworld. Charlie Chan: "Osiris is the mythological god of the underworld." With the Women's Movement growing in the United States, as was the case in many traditionally male-dominated roles, there was a push to include women in the sport of car racing. As a reflection of that time, we hear Anne exclaim, "Boy, that's what I'm gonna be, a racing car driver!" to which her brother, Tom, replies, "Woman racer? Forget it!" Henry sternly corrects his brother Stanley who just converted the Chan in order to disguise it, "I said dune buggy, not Moon buggy!" At the time of The Amazing Chan and the Chan Clan, NASA's Apollo moon program was in high-gear with moon landings becoming something of a commonplace event. The Apollo Moon Buggy was used by astronauts to explore the Moon's surface.